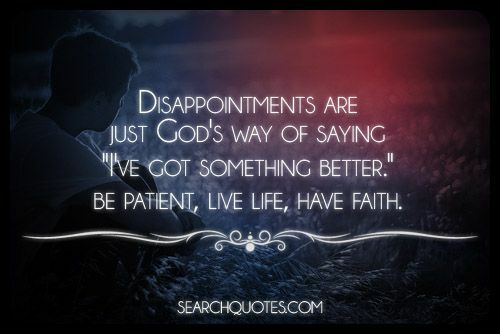 Disappointments are just God's way of saying "I've got something better." Be patient, live life, have faith. One thing that we must all endure through in our lives is disappointment. If we had our way all of the time, life would not really have much zest. One of the things that makes life really worth living is problem solving, and figuring out how to make our lives the lives that we truly desire to live. If we choose to let our disappointments stop us from living the life we know that God has destined for us to live, then we choose to let disappointment ruin us. God always has a plan for our lives, but he does let us choose whether or not we will follow his direction or not. Continue to walk in faith, and disappointment will no longer hinder your life from being the great life it should be, and the great life that it will be if you just continue to be patient, and if you continue to believe. Everybody dies, but not everybody lives. The Main Reasons Why We Lose Our Enthusiasm. "You Are Not Pretty,You Are Beautifull"
Human Race Is Doom To Stupidity.